It feels like the longest time since I've posted about anything I'm making – and even longer since I've posted about a finished project. And while finishing anything seems a long way off at the moment, I thought it was high time I posted about a crafty work in progress. Early in 2013 a craze hit Instagram that I just had to join. It was the #scrappytripalong project – even doing an image search on Google gives you an idea of how big it was! Hundreds of people around the world made the scrappy quilt in colourways of their choice and posted their progress and finishes online. My progress on that quilt is for another day, but when 2014 rocked around the new challenge was the #economyblockalong. I really did try to resist this one. I knew I was going to have a lot going on for the first half of this year and I really didn't need another quilt to add to the list. I'm not so sure about that logic, but I am making progress and I'd really like to have the quilt top together by the end of the month. It seems do-able with 30 days to go! As an aside, I really can't wait to move into a place of my own. One of the things that bugs me a lot about this rental is the light. My beautiful Marrickville apartment in Sydney had the most amazing light that was perfect for taking pics for the blog, but this south-facing apartment in Melbourne is just dreadful! So I apologise for the quality of these pics, it's the best I could do this afternoon. Has anyone else jumped on the #economyblockalong bandwagon? Thanks Wendy! 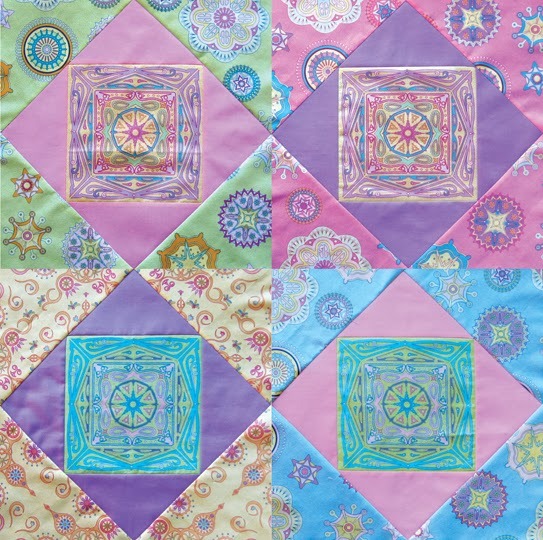 I knew a fellow-quilter would see the sense :-) I've just taken a look at your blog – my goodness you've got a lot of things on the go at once!